Liza Marklund reads from Kalter Süden. Liza Marklund is a novelist, newspaper and television journalist, and publishing executive. She is married and has three children. Her suspenseful novels about Stockholm crime reporter Annika Bengtzon, who juggles a career at a busy tabloid with the conflicts of motherhood and home life, are bestsellers worldwide. Not all of them have been translated into English. 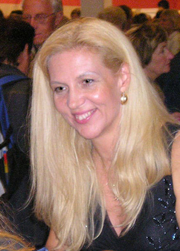 Liza Marklund is currently considered a "single author." If one or more works are by a distinct, homonymous authors, go ahead and split the author. Liza Marklund is composed of 4 names. You can examine and separate out names.